Proving Grounds 10 - Photos and Recap | MMA Fighting Events Videos Techniques UFC Fight Picks and News. 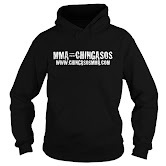 Chingasos MMA writer, editor, and talent scout. Savant Young is the host of Proving Grounds, one of the top amateur MMA shows in Southern California. The tenth edition of Proving Grounds was held on September 28 in Pasadena, California at The Fight Academy. For this tenth edition, Young started a four man tournament at 170 pounds. The winner will get his medicals paid for their pro MMA license. The show was full of excitement from beginning to end, starting with live music from The Hashishans, a top local reggae band in the Los Angeles area. The night continued with eleven exciting fights, only three which went to the scorecards. To get the night started was a fight between Hector Trujillo of Combat Concepts vs Chris Mendoza of The Submission Factory at 125 pounds. Trujillo showed his stand up skills by dominating the striking throughout the fight. He also got a takedown to end the first round, which demonstrated his total MMA game. Mendoza came out strong in round two, showing more movement and even got a takedown. Trujillo got back up and used his superior striking for the knockout. Next was Sean Guzman of The Fight Academy vs Cameron Harris out of PKG at 135 pounds. This fight ended in the first round. Harris landed head kicks, but it was his hands that ended the fight. Harris knocked Guzman down and was able to finish the fight with ground and pound. The third fight was Edward Fantauzzi from Combat Concepts vs Kevin Martinez from Defiant Muay Thai at 145 pounds. Fantauzzi got a takedown, took mount and landed chingasos. He moved to the side and finished the fight with a head and arm choke. The ladies fight was between Angelene Melendez of Adrenaline Combat Sports vs Amanda Jones of Dynamix MMA at 135 pounds. Both ladies came out throwing chingasos then clinched. The ladies were up against the fence when the ref broke it up. Melendez came out firing and dropped jones. Melendez finished the round with ground and pound. In round two, they came out throwing chingasos again. Jones got the takedown and took mount. Jones finished the fight with ground and pound from the mount. Up next was Derion Chapman from House of Champions vs Cameron Thomson of PKG at 155. Chapman came out throwing head kicks and a spinning back fist. Both fighters clinched, but they released and started throwing again. Chapman landed a straight right chingaso that dropped Thomson. The ref stopped in to stop the fight. Up next was Jalin Turner from Adrenaline vs Ian Quinto from Defiant Gym and The Yard Muay Thai at 145 pounds. Quinto ducked under a head kick and went for takedown but ended up on bottom. He reversed and got on top. After the ref stood them up, Quinto dropped Turner with a hard right. Turner was able to recover and finished round throwing chingasos. In round two, Quinto got a takedown and went to side control. Turner recovered guard and went for a guillotine. The round ended with Turner holding the guillotine attempt. In round three, Quinto once again went for the takedown but Turner ended up on top. They battled the whole round for position with Turner being able to land some shots. The next fight featured Sonny Sweet of Adrenaline vs Renee Conant from The Submission Factory at 145. Conant clinched, put Sweet up against cage, and got the takedown. Sweet fought his way back up, but Conant threw him back down on the mat. Sweet trapped Conant in a triangle but it was Conant that landed punches. In round two, Sweet landed kicks to the leg. Conant was able to time one of the kicks and got the takedown. Conant finished the round with ground and pound. In the third round, Sweet landed a hard right, but Conant walked right through it. Sweet got a takedown and took the back to work on a rear naked choke. As the round ended, Conant dumped Sweet on his head to escape the RNC. Winner: Renee Conant via unanimous decision. This was the first fight in the 170 pound tournament. 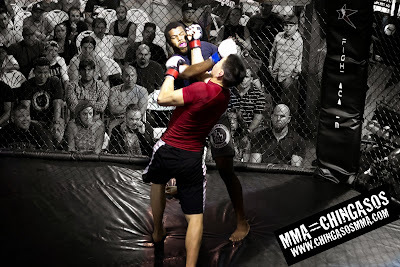 The fight was Oliver Kaufman from Dynamix Martial Arts vs Antonio Llerenas of Defiant Gym. Llerenas quickly got the takedown. Kaufman trapped an ad and went for an armbar. Kaufman did not lock Llerenas's leg so Llerenas lifted Kaufman and slammed. Llerenas knocked out Kaufman with the slam. Winner: Antonio Llerenas via knockout. The next fight was Elliot Jones of The Fight Academy vs Michael Bañuelos of SoCal MMA at 155. Bañuelos got a takedown but Jones quickly got up. Both fighters threw chingasos from standing to end the round. In round two, Jones landed chingasos and Bañuelos decided to go for a takedown. Jones got up and landed more shots. In round three, Bañuelos got a takedown, but Jones got back up. Jones landed hard uppercuts and finished the round with a takedown. Winner: Elliot Jones via unanimous decision. With both fighters having over three fights, Jose Medina of Pankration Combat Grappling vs Adrian Vasquez of PKG at 145 was three rounds of three minutes. Medina landed a kick to the leg that knocked Vasquez to the ground. Vasquez got up and they clinched. Medina got a takedown, but Vasquez quickly worked his guard. Vasquez threw his legs up and finished the fight with a triangle. Winner: Adrian Vasquez via triangle submission. The second fight of the 170 pound tournament was Kenneth Hwang of The Fight Academy vs Dejon Daniels of Sparta MMA. Daniels rushed in to get the clinch. Daniels got the takedown, but Hwang popped right up. Both fighters exchanged chingasos with Hwang landing a few good leg kicks. In round two, Hwang slammed Daniels to the mat, took mount, and then moved to the back. Hwang ended up back on top and went for an armbar before transitioning to a triangle. In round three, Hwang came out throwing and landed chingasos. Daniels fell against the cage and the ref stopped the fight. Winner: Kenneth Hwang via knockout. In this fight, Hwang deserves extra Chingon points for taking the fight despite Daniels not making weight and missing by a lot. For upcoming MMA events, make sure to check in on www.ChingasosMMA.com and don't forget to "Like" us on Facebook.